Hello my readers, I hope you're all still there. It's been more than three months since I last blogged and I can hardly believe it myself. The reason, you ask? Well I am now living in England pursing a Master's degree in the beautiful North-East. I've been here a little over two months and love everything about the place. Before I came here, I was definitely excited and not sure what to expect but it is amazing how quickly I have come to feel completely at home here. Before I got here, I promised myself I wouldn't slide into the student routine of pasta and cereal. I thought I'd be able to recreate all the stuff I make back home, I thought that I'd be resourceful and great and amazing by cooking a four course dinner for twelve people in a kitchen I share with five others with a limited number of utensils to exploit. I'm happy to say that I haven't completely turned into the pasta and cereal person, but there are days where I just couldn't be bothered. There are days when the type of food you eat is surprisingly at the bottom of your list of current mental preoccupations... Although, me being me, I tend to compensate by every once in a while going off on a culinary tangent and whipping up something really weird. Just today I chucked the entire contents of my fridge into a stew which was....interesting.... to say the least, but hey, at least I got to answer a long-standing curiosity of mine which was: what do mushrooms taste like boiled? And let me tell you, they don't taste bad at all. 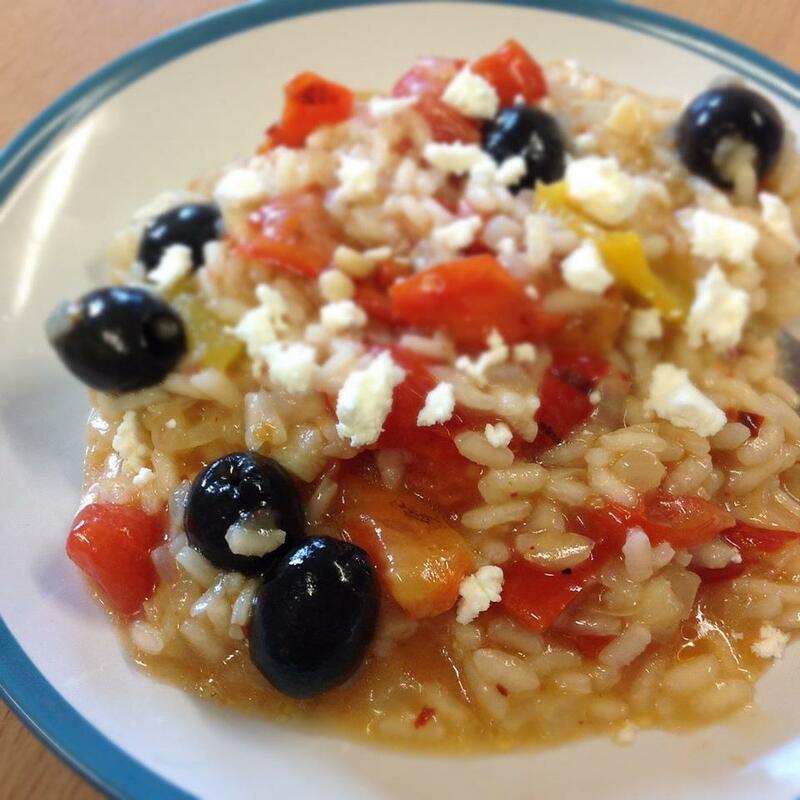 But the recipe that I am going to share with you today is one I made last week which I have quite creatively called "roasted pepper, tomato, feta, and olive risotto". There I was, reading about the benefits of a combined effort of Track I and Track II diplomacy, and how community-based peacebuilding can really positively impact conflict transformation when all of a sudden my mind wandered.......and wandered....and wandered... until it got to a place it had never really been before. And that place was plain-risotto-land. Yes. Why didn't I EVER think of making a COMPLETELY plain risotto and adding on whatever I wanted to at the very end since they would be ingredients that didn't really need to be cooked. Genius? Genius. And so I walked the five and a half steps to my airy little kitchen and chopped up some onions and garlic, heated some oil in a pot and got cooking. And what I came up with was what you see below. So here's the recipe, I do hope you get to try it someday, or maybe you've already tried something similar. What's your favorite risotto that you've invented? Heat the oil in a large pot and add the onion and garlic. Stir for five minutes until fragrant and soft. Add the rice and stir for one minute to coat in the oil mixture. Add two ladlefuls of stock and stir until absorbed. Repeat process for about 20 minutes or until rice is creamy and cooked through. Season to taste then add the olives, feta cheese, cherry tomatoes, and red peppers. Remov from heat, add two tablespoons of stock, cover, and allow to rest for five minutes before serving. Why does a man care to gnaw a slice of something bleeding and dead? “But why don’t you eat meat?” That’s a question that has been posed to me countless times over the past 11 months that I’ve been a vegetarian. People seem to be so curious and I find it interesting how they’re intrigued; yet whenever someone ends up making further comments such as “Eating meat is natural to us omnivorous humans- do not deprive yourself of it” and “How can you not like meat?” I feel like throwing out the question: why DO you eat meat?! And furthermore, I’m not writing books and giving lectures on the benefits of vegetarianism so kindly let me live my own life in my own little bubble. I never harp on and preach about the benefits of vegetarianism and I never try to convert people to it so I think people should take that into consideration and let it be a personal choice which affects nobody but myself. I don’t preach about vegetarianism to the point that I cook meat whenever I have guests over. For me, it’s simply a personal choice and although I may not be making an impact on what I believe in (how animals should be treated) I’m doing the minimum that I can by refraining from something that I find disturbing. Ever since I was in my mid-teens, I started getting queasy at the idea of eating meat. Whenever there would be a piece of meat on my plate, I’d inevitably think of the animal that it once was- a fluffy, bouncy little lamb, or maybe an adorable hen. That imagery alone was enough to put me off from eating whatever was on my plate but I would keep on telling myself to just push away those images and eat the meat. And inevitably, as I’d chew the meat I’d keep on thinking that this is DEAD FLESH that I am eating and putting into my body. Many people reading this might feel disgusted walking up to a dead animal whose guts are pouring out…but that is exactly what the meat that’s on your plate for lunch was before it entered the factory then the supermarket then your kitchen and eventually your digestive system. So how can you put something into your body through your mouth when you wouldn’t even be able to bring yourself to touch it? When I think of myself as a middle-aged woman, I don’t see myself as still being vegetarian. For some reason I think I’ll give in and start eating meat at one point. But the interesting thing is that the longer I am a vegetarian, the more unfathomable the concept of me eating meat becomes. And- the longer I am a vegetarian, the easier eating out gets. Plus, I’ve discovered such creative ways of cooking vegetables this past year because being vegetarian has made me put in the effort to finding diverse ways of using vegetables. And on a side note to those who, like myself, love aesthetically pleasing things: vegetables just look so much prettier with all their bright colors and textures than a brown, rubbery, dull slab of meat does. So although I kept on pushing away the idea of becoming a vegetarian, eventually I decided to gather my strength, courage, and determination and give it a go. I was a vegetarian for precisely a week when I was at a friend’s house and I just gave in and ate chicken. The same thing happened at another friend’s house a week later. I just found it too difficult. Coming from this region- the Middle East- being a vegetarian is quite difficult- INITIALLY. But now I have no problems whatsoever. I should say now though that this essay is not based on any scientific research whatsoever. It is simply a reflection on why I am a vegetarian and what made me become so and although I did watch videos and read articles about the poultry industry for example, statistics and details of this didn’t really factor into my decision of becoming a vegetarian- although the general topic did: animal cruelty. So if I were to provide one reason for why I am a vegetarian it would be the cruel practices of factories and corporations and industries today. The food industry is a huge one but in my utopian universe, food would not be a profit-generating industry. It would not be used politically and it would not be turned into a business. Food would be there to feed people and that is it. It would be there to simply feed those who need it and any industry affiliated with it would be non-profit, non-governmental organizations focused on distributing the food equally. But going back to topic: the primary reason that I am a vegetarian is because I oppose the practices of major food corporations and factories. I’ve watched videos, read articles, and heard conversations that all revolve around the same topic: how the hens are made to sit in metal cages, how they are forced to eat their own feces, how they are injected with hormones to fatten them up, how they are killed (with a simple crack to the neck in many cases if you must know), and how- most disgustingly- they are genetically modified to make it easier for them to be killed. How can anyone be so blind as to see what is happening is wrong? Forget the fact that the practices are downright cruel- THEY ARE HARMFUL TO YOUR BODY. And the least you owe yourself is to take care of that body- of which you only have one- and to take care of your life- which once it has passed will never come back. This following point might seem a bit quirky or maybe downright loony but I am uncomfortable with the idea that a living creature (non-plant) is being made to suffer just so I can put a bit of it into my mouth WHEN I CAN EASILY SURVIVE WITHOUT IT. I see it as a form of slavery and my conscience just don’t let me enjoy my meal knowing that animals have had to suffer because I am too stubborn to see the injustice and unhealthiness of these practices. I can’t seem to feel comfortable with the idea that a living creature’s sole purpose of life is to die so that I can be fed. NO. Don’t you see how wrong this is?! I’ll be lying if I say that my decision to go vegetarian had nothing to do with health reasons. It partially had to do with health reasons but not because I wanted cut down on calories on eliminate red meat: it had to do with the fact that chicken (the type of meat that was primarily what I ate) is almost always injected with hormones and is almost always mass-produced (sounds disgusting when I apply that factory term to a living thing, doesn’t it?) and that by its very explanation should deter anyone from eating meat. Just the same way an extremely health-conscious person steers away from packaged and tinned foods, so should one stay away from meat due to the practices used to obtain it. So, to conclude, I am a vegetarian because to me it seems like the logical thing to do. I would love to do more to spread awareness about the practices of meat factories and corporations and to minimize as much as possible the suffering that millions of animals go through on a daily basis simply so they can enter your stomachs (in an unhealthy way!) but for now, I am doing the least that I can and am simply pondering the deeper, more philosophical points of vegetarianism. And before I forget, another response I would like to mention here is that: “If everyone was vegetarian, we’d have hens and cows and goats take over the world.” Well, let me assure you that I think there are already waaaay more chickens than humans on Planet Earth. Secondly, the reason there are SO many farm animals is because of supply and demand: these farm animals are excessively bred BECAUSE there is so much demand for meat. As the demand goes down so will the supply, eventually. And no I do not think that EVERY ONE of use 7 billion people on Earth should be a vegetarian because at the end of the day: even though animals are living creatures that must be treated with kindness, they are ultimately there for humans to thrive. Leather, wool, meat, cheese, eggs, etc… all this provides a livelihood to people but the way to go about it is for industries dealing with farm animals to be small businesses and individual suppliers- no mass production, no profit-maximization. FINALLY, yes I do realize that dairy products and eggs come from farm animals that are also exposed to equally horrendous conditions as the animals used for meat but I am doing what I can in my personal diet right now and I do not think I am ready to make the step towards veganism. Well, I’m going to say the exact same thing now, too. It’s been two months since I posted anything but there is absolutely no excuse this time. No longer am I a college senior racing against time to finish assignments, struggling on little sleep and even less inclination. I am officially a graduate at that transitory phase in life where I’m no longer an undergrad, yet still not part of the official labor force. What I’ve been doing for the past month is cooking and baking (so why haven’t I been blogging?!) and meeting friends. Oh, and catching up on sleep and adjusting its ledger after months (years?) of depriving it of what it’s really due. As to why I haven’t blogged… I really don’t know. I’ve noticed that I am becoming increasingly less frequent when it comes to facing a computer screen. No longer do I have to read hundreds of pages worth of PDFs or write thousands of words worth of papers. What I do online now revolves around facebook, twitter, email, pinterest, StumbleUpon, news’ sites, and instagram. All which can be done with a smartphone. 21st century technology is fascinating. Yet it still baffles me how scientists haven’t yet invented teleportation or the time machine. I personally think it’s VERY probable. I mean, it sure does sound insane at the moment and possibly even scientifically impossible (I mean compressing all yours cells and zapping it from one place to another? REALLY?) But how crazy did a video call sound even in the early 20th century? I mean... seeing someone as if they were right in front of you although they may be thousands of miles away? How’s that possible? If you place yourself in the shoes of an unassuming person of average intelligence in the 18th century, they would probably think you’re high. I would love to bring a person from a few centuries ago to today and see their reactions to all our mod-cons and all our awesome technology. Air-conditioning, a television, Skype, photography, AIRPLANES??! (ESPECIALLY airplanes!). Is anyone remembering Kate and Leopold here? I just love that movie… and Hugh Jackman’s reactions to things as mundane as television and (was it?) a toaster. 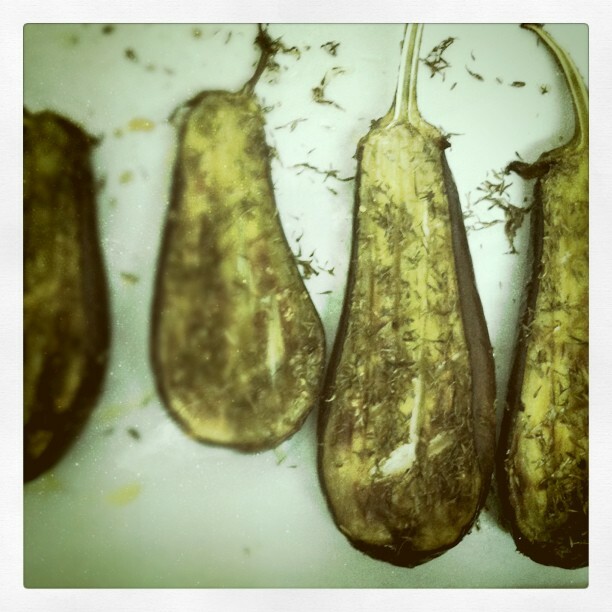 This post is about my developments in the culinary field and what I’ve been up to this past month. In terms of culinary developments, I’ve been making plenty of finger food. They’re adorable, bite-sized, have the potential to look amazing, and are really flexible so testing creativity is no problem here. I’ve been doing a mix of savory and sweet- making things such as mini halloumi burgers, stuffed tomatoes, burrito wraps, mini pavolovas, and individual mousses. WHAT IS IT about individual dessert servings that make them SO-freakin’-APPEALING? 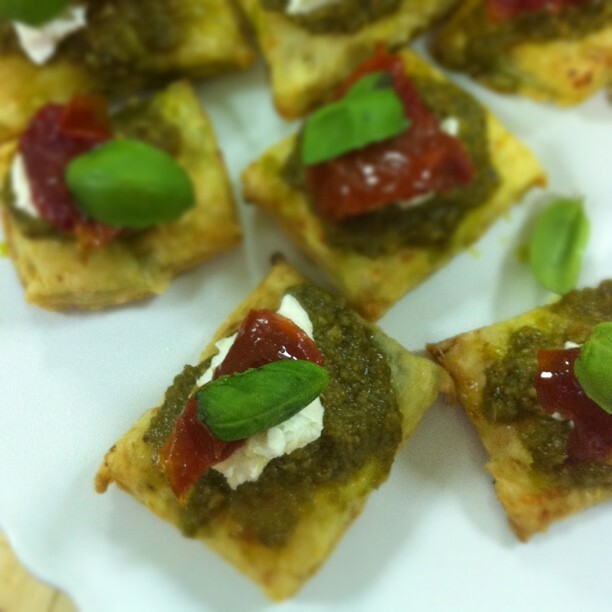 The reason I’ve been making finger food is because it’s been Ramadan for the past month. Ramadan is the month where Muslims fast (for 30 days, or 29-depending on the moon) from sunrise to sunset. So that’s x hours (insert your city’s solar schedule here- almost 15 hours for us) of no food and no water. Basically. The month is about coupling this daily abstinence from food with an increased level of spiritual awareness and divine devotion. The month is about reading the Holy Quran, praying as much as possible, remembering your sins of the year and asking for forgiveness, engaging in charity, working towards developing yourself into a better human being, reconnecting with friends and family, and strengthening your faith. In a way, Ramadan becomes a fast from all the things which distract us from what’s really important: faith, patience, compassion, generosity, self-development, family, and friends. I love this month because I think life becomes about what it truly should be about. I’ve never felt as connected to the divine (and thus, the world) as I do this month. The moments with friends and family this month are special ones that don’t come often. I can’t emphasize how much so many of my fellow Muslims look forward to this month- it is undoubtedly the most favorite of the entire year for many. On the surface that may seem shocking as even I wouldn’t really feel inclined towards the idea of not eating for 15 hours a day for 30 days straight. But you just have to take part in the month to feel its beauty surround you. 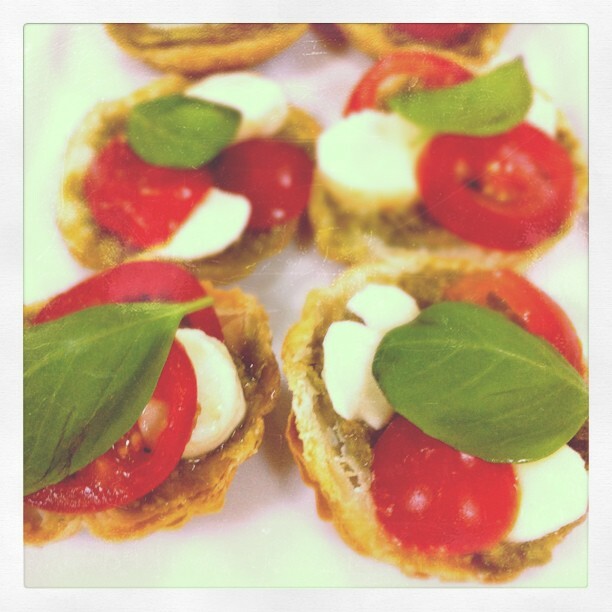 Moving on to the recipe, today I’m sharing with you a recipe for bruschetta with pumpkin and sage. Pumpkin and sage is a wonderful combination as both flavors complement each other wonderfully. It makes a lovely snack, a wonderful appetizer, and a great supper. On a heated grill pan, lightly toast the baguette slices for 1-2 minutes on each side or until crisp. In a large saucepan, heat the olive oil and then add the onion. Stir to coat in the oil and continue stirring on medium heat for 5 minutes or until onions have become translucent. Reduce the heat and cover the pan with the lid for 10 minutes, checking often and giving the mixture a stir so that it browns evenly. Halfway through, stir in the brown sugar and balsamic vinegar. Once the onion mixture has caramelized add the butternut pumpkin and the chili flakes and stir to coat it with the onion. Slightly increase the heat and continue stirring for five minutes. Place the lid on the pan and allow to cook for 10 minutes. Next, remove the lid and add the chopped sage leaves, stirring thoroughly. Continue stirring for about five more minutes or until the pumpkin has cooked through. Remove from the heat and allow to cool slightly. Add in the feta cheese now if using. Then, take heaped teaspoons of the onion/pumpkin mixture and spread over each baguette slice. Garnish with a basil leaf. As one chapter ends, another begins. That phrase had been going through my mind for the past month. After four years of studying, reading, researching, and writing, I have finally graduated with a B.A. in International Studies. Now, things for the first time are like a blank page- waiting for us to fill it with splashes of color. Everyone says that, now, we are finally in "the real world" (although I was told that when I graduated high school as well so I don't know which version to pick really...). We're continually told that the toughest and most challenging is yet to come and that our college days mark the last of being absolutely carefree. It seemed kind of paradoxical to us. We weren't exactly "care-free" while pulling all-nighters, and reading hundreds of pages a week, and racking our brains thinking critically. But in retrospect, although it's only been eight days that I've graduated, I can somewhat sense what everyone meant. Our primary responsibility was ourselves, and our grades. And if we didn't really commit to that, we were ultimately the only ones who suffered. But now, with getting jobs and starting families- a lot of other people factor in the equation- and they all have to be taken into consideration when we make decisions in our lives. 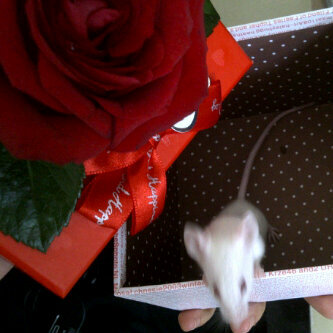 The mouse disguised as a "present"
But I'm glad that I realize that while also having lived "in-the-moment" during my university years- especially during my last year. I tried my best to experience as much as possible and enjoy every little moment- because I'd heard so much from my older friends about how "these days never come back". Most of the time, experiencing and enjoying as much as possible simply meant sitting with friends and having a good conversation. Or doing something really laid back- like playing Carem- or something really silly- like accidentally flinging a lab rat on the department table and terrifying everyone around me with my screams. (Do not ask how a lab rat ended up in the department of international studies- where, I can assure you, no biological experiments of any kind take place). On my last day of classes, I felt extremely melancholic. How many of the tons of friends that I made would I see again? And even if I did, it wouldn't be in the same environment that I had grown to love. But we move on, and as with any milestone in life, it's marked with celebration. A few days ago I threw a small party marking our graduation and invited a few close friends. I had chosen the theme to be white (don't ask me why, maybe because it's one of my favorite "colors"). So everyone, almost everyone, (I can imagine the ones who didn't squirm while reading this, haha) wore white. I had some white balloons and had a white dessert table. White desserts were mini vanilla cupcakes with white frosting, sugar cookies (which I wanted to ice with white royal icing but didn't have time to), white meringues, white chocolate cake pops (with ginger cake inside), white marshmallows, white rice krispie treats, white chocolate mousse, and white panna cotta. It was the first time for me to make panna cotta and yes, I admit it's kind of silly making something for the first time just a few hours before you have guests over! But that's me and my idea of being daring. Also, I didn't even manage to try it before I pulled it out of the fridge and served it to my friends. But they liked it, and I had a few spoons and liked it. So there. Yesterday, I made some more. This time, I wanted it vanilla and passionfruit flavored. I love the crunchy seeds of a passionfruit. But all three nearby supermarkets were out. So I resorted to making the panna cottas dark chocolate and raspberry flavored- which I don't regret one bit! Place one cup of the whipping cream in a deep pan and sprinkle the gelatin over the top. On low heat, stir the mixture until gelatin dissolves. Then, add the caster sugar and remaining whipping cream and stir until sugar is dissolved. Next, add the seeds of the vanilla pod and the vanilla essence and stir through. Pour mixture into containers of your choice (I made 12 servings in 1/8 cup sizes) and refrigerate until set. Before serving, melt the chocolate with the olive oil in a double boiler. Pour over the panna cotta and arrange with raspberries on top. What did you do during Earth Hour? I, for one, sat in the 'dark' with some candles and ate this great fusion salad. All the lights were off but the TV just may have been on (shh!). I love taking part in Earth Hour although I constantly wonder how much of a long-term impact it has. I'd like to statistically analyze how much it increases awareness, sparks environmental concern, and reduces consumption levels. But that isn't something to do on this blog. You're here to read recipes and check out photographs of course. The environment is something that get me very gloomy very quickly. Reading any statistics or case studies leaves me feeling so bleak. Moreover, in my Public International Law class today we discussed how there is very little accountability when it comes to the environment. Oil companies can empty out their tankers in the middle of the ocean killing thousands of fish but no one will ever know. This leads to marine life obviously being contaminated but even if someone does manage to find out, how easy is it to bring a company to justice? We treat the Earth- who gives us everything we need to survive on- like trash. And we're slowly going to turn it into that. How can a person not feel a sense of responsibility? Just because the air in the atmosphere, or the ozone layer, or the seaside doesn't officially "belong" to you doesn't entitle you to deal with it in any manner you please. But would you go wreck somebody else's couch just because it's not yours? No. People fail to grasp that the Earth IS theirs. We are all from this Earth. Maybe this sounds a bit hippie but I wish people saw each other not in terms of religion, ethnicity, race, or nationality, but as people just like them- belonging to the same earth, breathing the same air, drinking from the same water, and eating from the same soil's bounty. But enough of my rant. Keeping in spirit with the hippieness- here is a fusion recipe. I find fusion cuisine to be the hippie of the culinary world- it's all about coexistence and harmony between two or more diversely different ingredients. And fusion is something that, in my opinion, you must get right. It's not like normal cooking where changing just one or two ingredients still makes the dish work (sometimes exponentially so). If you put just one wrong ingredient into a fusion dish- you've had it. Maybe my analysis is totally off the mark but it's what I think based on the fusion food I've tried making and the ones that I've eaten. Getting it right requires a special level of talent and skill- an ability to instinctively know what to pair together. I did no sort of that instinctive analysis when making this salad- The sauces that went into the tofu were a totally last minute thing that I used just because I happened to see them lying on the kitchen counter. Mix the tofu cubes with the combined sauces and set aside. Heat half the olive oil on a grill plate. Grill the zucchini slices for 1-2 minutes on each side until softened and lightly browned. Heat the vegetable oil in a wok and add the tofu cubes with the sauce. Stirfry for about 5 minutes or until cooked through. 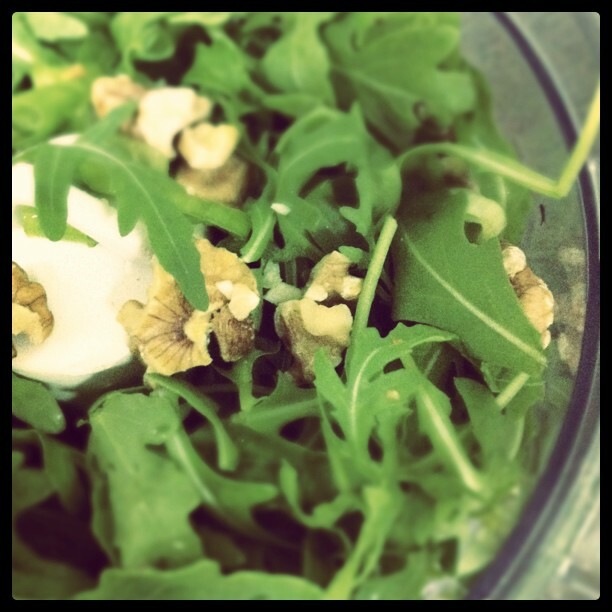 In a large salad bowl, mix together the rucola leaves, grilled zucchini slices, tofu, pine nuts, and green olives. Mix together the remaining olive oil with the basil pesto and drizzle over the salad- mixing together thoroughly. This salad can be covered with a plastic wrap and refrigerated. We all have our favourite ways to unwind. Yours might be to curl up with a book (I like that, too). Another person might go for a long walk (I also like that, too). I, for one, first head into the kitchen. There's nothing like shutting yourself off from the world for a while and indulging in your creativity. The scene is perfected if you have someone keeping you company who you can talk to or if you have some of your favourite music playing (what I like to play when I cook is some Chopin or Mozart, Arabian or Latin lounge music works too, though). This week I'm on spring break. That means nine days of not attending class and also, in my case, not looking at anything remotely academically related. I think we all need to tune out for a while; it helps re-energize and motivate. After seeing this beautiful post I was inspired to create something with the same jell-o technique which I find absolutely gorgeous. But I made it cheesecake style. Because I had also seen a picture of individual no-bake cheesecakes in jars on Pinterest. So voila I combined the two. And what better flavor combination than lemon and blueberry? Ok there's raspberry and white chocolate and pumpkin and sage and caramel and apple. But you get my point. The lovely thing about this is that it's so versatile- you can experiment with so many different fillings. I had to make my own jello as all the supermarkets were out of lemon-flavored jello, but it was healthier (if that's possible!) since the flavors were real and not artificial like the ones we get in sachets here. The result was fabulous at the end but I would've loved to have a deeper yellow for the jelly. Also, only after eating it did the ditz in me realize that gelatin is not vegetarian-compatible. And I was at 5 days short of 6 months of being vegetarian. Anyways, the past is in the past. Let's move on and get to the recipe. This makes 10 servings. I made four and turned the rest into a trifle. Boil the lemonade and pour over gelatin. Add lemon juice and zest with sugar and stir through. Beat together the sweetened condensed milk, cream cheese, lemon juice, and vanilla essence. Gently mash the blueberries and stir through the cheesecake mixture. Just before using, beat once more. Place a quarter cup of liquid lemon jello in a 250ml glass. Place the glasses in a loaf tin at a slant angle and refrigerate until set. Once set, fill the other half of the glass with the cheesecake mixture. Sprinkle the crumbled biscuits as a topping and garnish with some lemon zest and blueberries. 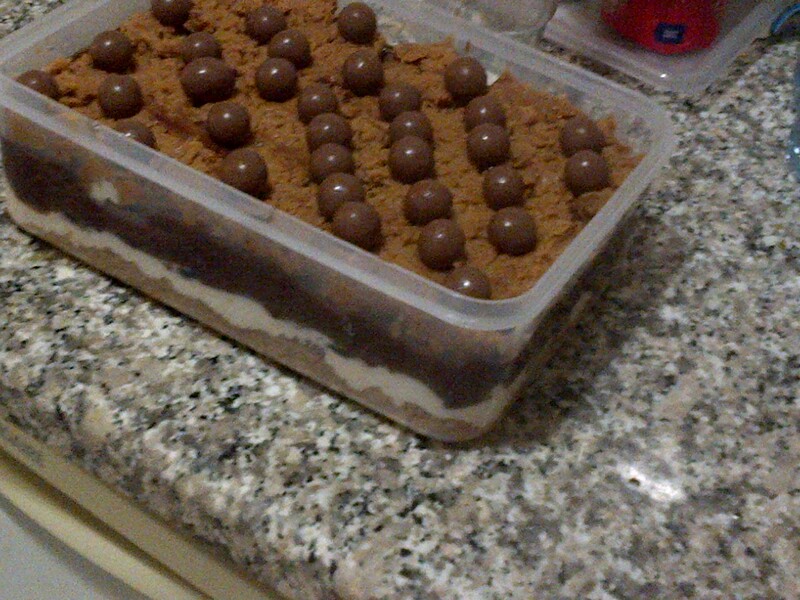 This is what I did with the leftovers: made a trifle! There's something so refreshingly creative about mixing together random ingredients and coming up with a wonderfully tasting dish. Last week, some of my friends and I were having a small picnic among one of the many grassy lawns in our university. I needed something that was filling and quick to make. Albeit this a wasn't picnic-friendly dish what with having to use bowls and forks, it was still fun to eat. And make. I looked through my refrigerator and cabinet and lined up random ingredients on the kitchen counter. I chose couscous as the central ingredient for my dish and decided to pair it up with ingredients that would complement it. It's amazing how starting off with a central ingredient can build up a great, unique dish. I recreated it today at home for lunch and everyone loved it. Place the couscous in a bowl and pour over the boiling water. Cover the top with a plate and leave to rest for 5 minutes. After that, fluff up with a fork. Stir in the lemon juice and salt. Mix in the rucola leaves and stir until thoroughly combined. Next, stir in all the ingredients apart from the last five. Make a paste by combining the olive oil and basil pesto and stir through. 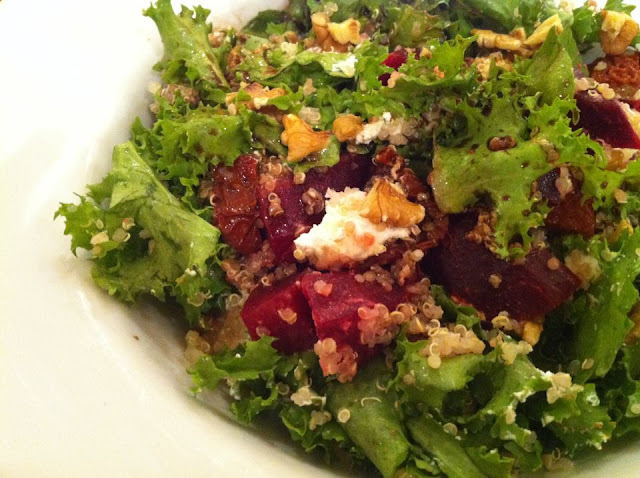 Scatter the crumbled feta cheese and cranberries over the top and mix well together. Add the balsamic vinegar and gently toss through. Helloooo everyone! I can't believe it's been more than a month since I posted.. I think this is the first time I've skipped an entire month of posting ever since I started blogging. Things have been quite hectic- I started my final semester at university four weeks ago and also moved in on campus. Prior to that, I was out of town for a while. It's the first time that I've lived away from home and I am learning quite a bit about myself. Especially how OCD I can be when it comes to cleaning. I can't seem to relax if I haven't scrubbed the sinks, made the bed, sweeped the floor, done the dishes, and generally made sure everything's clean and tidy early in the morning. I've also had to be extremely resourceful when it comes to meals. I haven't relied on any recipes and make up my lunches and dinners from whatever is in the fridge (often a very creative process that I enjoy). Our dorm room also aren't equipped with ovens so I'm making a lot of scrambled egg and raw vegetable salads and crudites which I quite like. I've made it a goal that I don't want to order in any food while I stay on campus and I've stocked up my cabinets and fridge with things like wholewheat pasta and couscous, Greek yogurt, cherry tomatoes, capsicums, eggs, and baby spinach leaves. I'm sure many of you must have read the "no-oven" part and thought, "Wait, what's SHE doing without an oven?" To tell you the truth, I do miss the transformative nature a baked good has while in the oven, and I miss the aroma of freshly baked cakes wafting through the kitchen but this has given me the chance to delve into something I've always wanted to try more of: no-bake desserts! The other day I invented this layered trifle, pudding, dessert, or whatever you want to call it. Everyone seemed to like it although I do think it's akin to a calorie-bomb in a box..
Take a deep 9"x6" serving dish and place the Digestive biscuits at the base. With the back of a glass, crush the biscuits and stir in the melted butter. Press the butter-biscuit mixture down all over the sides of the dish. In a bowl, beat together the cream cheese, a quarter of the sweetened condensed milk, and a third of the cream. Spread over the biscuits evenly. Next, separate the two halves of the Oreos and place each half over the cream cheese mixture. In the bowl, mix together the nutella, a third of the cream, and half of the sweetened condensed milk. Spread over the Oreos. Break up the Kit Kats into tiny pieces and scatter over the Nutella mixture. In the bowl, beat together the peanut butter, the remaining cream and remaining sweetened condensed milk and spread over the Kit Kats. Scatter Malteser's on top. Refrigerate around one hour before serving. Sorry for the picture quality- I only have a phone camera with me! I haven't blogged more than a month. Why, you ask? Well I've had finals. And any of you who are in college/have been to college will know how stressful finals can be when they're in your senior year. Top that off with tons of papers due right before finals week and you end up with someone (me) who has no time to bake, let alone photograph and blog about it. I finally finished exams last week and have been busy in the kitchen making all sorts of things (which inevitably end up being eaten before they can be photographed). I made a lovely no-bake chocolate pudding/trifle dessert, a raspberry cheesecake (also no-bake), swirly blueberry and caramel ice-cream, tiramisu, cake bites (nope, not cake pops- cake bites.. my own invention), oreo cupcakes, and a whole lot of other savory stuff. This tortilla wrap I had been meaning to make for lunch since before my finals. I finally did, but I need to learn how to wrap it better. This is a delicious wrap that is filling and wholesome and a whole lot of fun to make. In a bowl, stir together the cream cheese and basil pesto until smooth and well-mixed. Spread over one side of each tortilla roll. In a pot, on high heat, heat the olive oil and then add the onions, coating to stir. Cook for five minutes and then add the balsamic vinegar and brown sugar and stir well. Reduce the heat to medium and cover the pot and allow to cook for 10 minutes. After that, increase the heat back to high and stir in pumpkins, sage, and chili flakes. Add more oil if necessary. Cook for 15 minutes, or until the pumpkin is soft. Season to taste. Remove from heat and allow to cool slightly before adding the rocket leaves which will wilt in the heat. Stir in the feta cheese. Place one heaped spoonful of the mixture in the center of each tortilla wrap. Fold over both sides (bottom and top) and then roll the left side of the tortilla over to make a wrap. Place on a flat surface with the fold at the bottom- this helps secure it. After five minutes, slice the wrap in the middle and serve! (Written on December 18- hence the lag in dates!!) I am finally getting back to normal routine after working for the Dubai International Film Festival for the past two weeks. It was an insanely busy time since I was sort of working full time and studying full time. I'm really glad that I chose to have all my classes on three days of the week this semester so that left me with Monday and Wednesday mornings to catch up on studying. This was my sixth year at DIFF and the first time that I worked on the red carpet. My first two years I was a volunteer and did everything from working at the standby queue to ushering and checking tickets. The year after that I became staff and managed the Green Room which was quite interesting. I was basically babysitting any VIP talent or film talent until the screening began. I got to see quite a few "celebrities".. I've never really been interested in them or their lives and so none of them impressed me so much... apart from Gerard Butler. Who is the most charming and witty person. Who I might have fallen in love with had I managed to spend more time with him. Hahaha. And last year, I managed the 1400-seater theater. That was a lot of fun, very challenging, dynamic, perfect if you're OCD about organization like me. But this year, I finally got to see all the energy of opening night as it happens. I was on the red carpet with the guests, invitees, security, press, and fans. And opening night was great since Mission Impossible 4 was premiering and the amount of worldwide press and fans we had was insane. Tom Cruise himself spent almost 2.5 hours on the red carpet speaking to every single fan and reporter. He was beyond nice. Except that a couple of times I kept on sarcastically wishing he was a snob like other celebrities so that he would just glide through and ignore most of the fans. I had to wait for him that entire time to do my job and got very impatient. But no, he was really nice and I am very impressed at how down to earth he was. Now that DIFF is over, I am experiencing withdrawal symptoms as I(and every other staff member) experience ever year. All of us staff are such a close-knit group that we're almost like family- family that gets to reunite once a year. I've made some great friends through DIFF, people who I consider to be closest to me. But enough about that, and onto the recipes. These are two side dishes I always make because they require very little effort and taste amazing. They're quite filling and make a very adequate meal in themselves. The first is an arugula and olive salad. 1 tbsp crumbled feta cheese. Combine everything together and serve immediately. The next dish is a wonderful meal in itself: roasted capsicums stuffed with feta cheese, olives, basil, and pine nuts. Roast the capsicums, skin side up in a 200C oven until the skin is blistered and black- around 30 minutes. Place the capsicums in a sandwich bag and seal well so that the steam loosens the skin. Allow to cool for around 15 minutes before peeling off the skin. 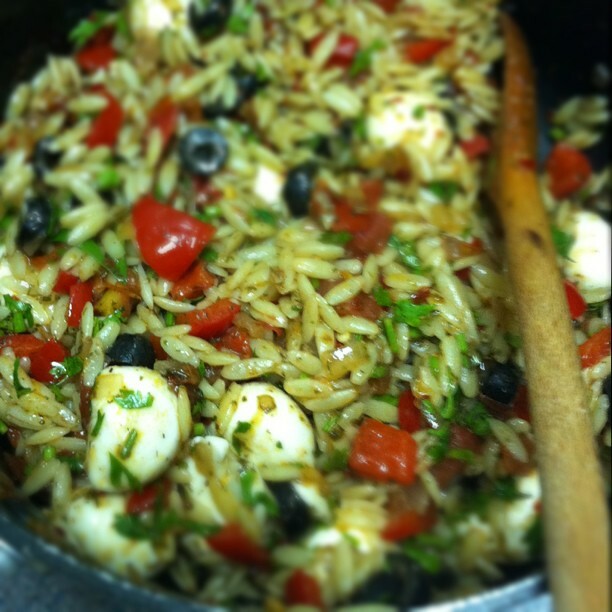 In a bowl, mix together the rest of the ingredients with a splash of balsamic vinegar, if desired. 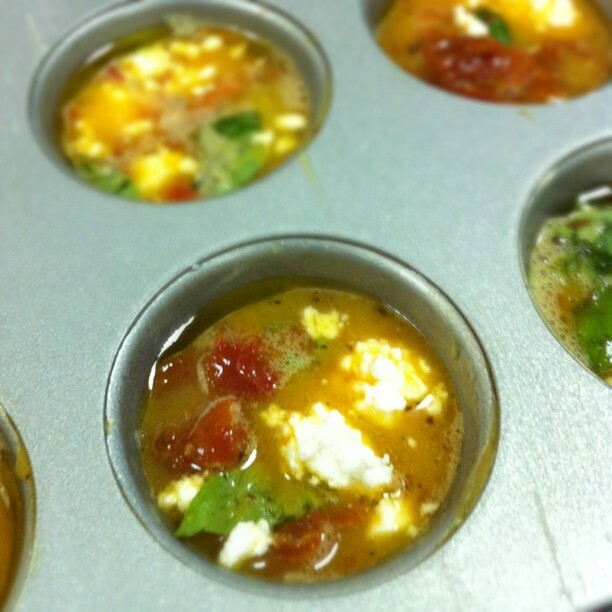 Take two to three teaspoons of the feta cheese mixture and place in the middle of each capsicum slice. Roll up and secure with a toothpick. Mix together the basil pesto and french dressing and pour over the tops of each capsicum. Last week, I had a small tea party- that's why I made those macarons. It was a wonderful gathering where I got to catch up with many friends whom I had not seen in a while. Sometimes life get so busy that you have no time to do the things you want to do most. I always ponder about how much we're slaves to a capitalist way of life. Work, studying, errands, extracirriculars, projects, businesses, and then- what happens to relaxing? Soaking up the atmosphere? Taking a leisurely stroll? Doing what you really want when you want to do it. I, for one, love catching up with friends in a relaxed atmosphere, I love cooking and baking, and I love organizing events- it's such a creative process. And so I put all those things together last weekend and threw a party. So the menu was made up of mini sandwiches in rectangular and triangular shapes, scones with homemade clotted cream, and mini cakes and tarts. The table was set with carnations and roses and pink-lined china. I also had a "tea bar" with a teapot full of hot water, sugar cubes, and milk next to tiny bowls holding various types of teabags- each bowl labeled with damask paper- all on lacey linen. I wish I remembered to take photos of the tea bar! These mini cucumber sandwiches are adorable to look at and VERY easy to make. I usually make them when I want a quick snack or when I feel like something solid with my soup dinners. They work really well with a roasted capsicum soup- the recipe of which I must share with you sometime soon- now that it's "winter". With a 3cm round cookie cutter, cut out two rounds from each slice of bread. If the slice of bread is a bit small for cutting out two rounds, use a pastry roller to flatten the slice out a little. Toast both sides of the rounds on a heated grill plate for around 1-2 minutes. Spread Philadelphia cheese on one side of each round. On half of the rounds, place a cucumber and a mint leaf. With the other half of rounds, cover the cucumber-rounds. Now that the rounds are sandwiched, top each with a cucumber slice and olive oil. Serve (almost) immediately because the water from the cucumber tends to make the toasted bread soggy after an hour or so. How can you have a tea party without tiered stands, right? Haha. 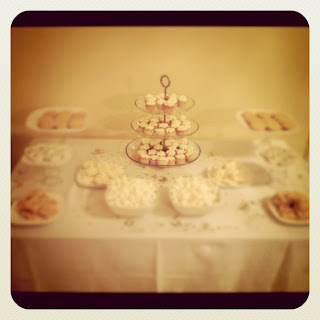 Here are some of the pastries and mini chocolate and vanilla cupcakes.